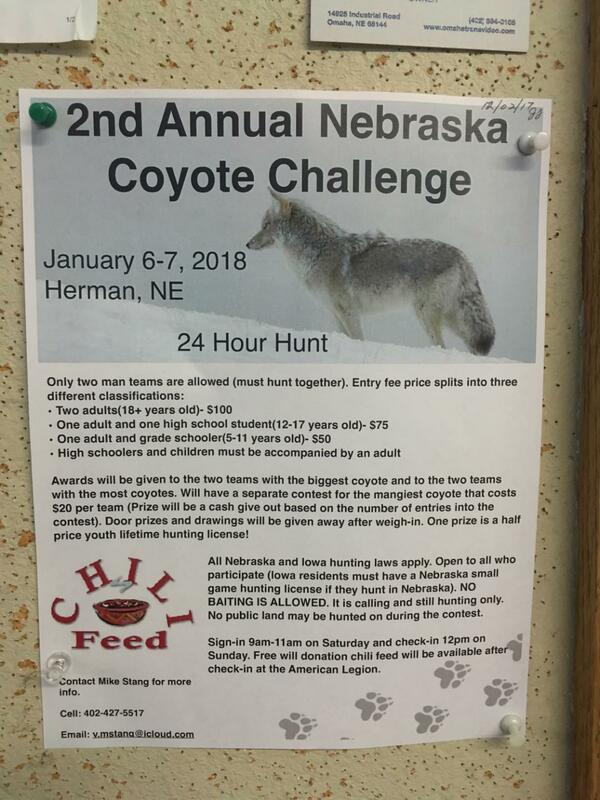 On January 6th and 7th, the second annual “Nebraska Coyote Challenge” will be held in Washington County, Nebraska. The premise of this contest is simple: two-person teams are challenged to find and kill as many coyotes as they can in 24-hours. Children as young as 5 years of age are allowed to participate if accompanied by an adult. Awards are given for the biggest coyote killed, as well as the most coyotes killed. Before I go on, I want to be clear that I am not opposed to hunting that is done lawfully, humanely, and for the purpose of procuring food. There are good people who hunt animals for food who are our daily allies in wildlife and habitat conservation, and we value their support and partnership. Unfortunately, this is not the purpose of the above-mentioned hunt, or of the other coyote hunts that happen across our state each year. This type of hunt exists simply to allow people to use other animals for target practice and to be applauded for it. Coyotes are animals with intricate family and community structures. When you kill a few dozen coyotes in a single day, in a relatively small territory like Washington county, you do extreme damage to their social structure. To compound the problem, winter is already a stressful time for wildlife and for coyotes, a time when last spring’s young are still learning how to survive naturally from their parents. The damage done to the social structure and territories of a coyote community with a hunt such as this one is incalculable. People also say that the only solution for a coyote suffering from mange is to kill it, but in fact, there are several non-invasive things we can do to help cure a coyote with mange and allow it to stay within the unique social structure of its community. For the animals killed in “contests” such as these, there is no selection process, and it doesn’t discriminate. Often, the ones that are taken are healthy and productive members of the ecosystem. There is no evidence that these coyotes have been harming human interests or behaving in any way unnaturally. Most are simply going about their lives, raising pups, hunting natural food sources, and keeping to themselves. During the hunt, they are lured in by call. These are not necessarily coyotes that are spending their days in proximity to humans any more than is necessary due to the shrinking size of their natural habitat. In short, killing coyotes isn't necessary or humane - the human reward for the death of another living creature may just be $25 for its skin. These days, it is not uncommon to see on social media and on internet news sites, uproar over charismatic animals far away being slaughtered for sport. Everyone reading this probably knows the story of Cecil the Lion or many of the other animals that are trophy hunted in places far away from us. Why do those stories bother us, and rouse us to action, but killing of vital members of our native ecosystems do not? Maybe it is simply because we think those other animals are prettier or smarter, that they should be exempt from sport hunting and contest killing. It brings me back to something I think about all of the time in my line of work -- To what animals do we extend our compassion? Who decides which animals are important and which are not? Which animals are worthy of protection, rescue, and human aid? I have rehabilitated dozens of coyotes in my career, and have come to know and respect these beautiful animals for what they are – intelligent, independent, joyous, devoted, canines - just like my beloved dogs. If you love dogs, it’s not a leap to be able to respect coyotes and to even understand them. I think it is the responsibility of animal advocacy organizations and anyone who is disturbed by this practice to speak out against the unnecessary and inhumane killing of wildlife. There is no glory in an animal killing contest, where bragging rights, prizes, and ego overshadow not only science, but decency and compassion.